Here are three ideas for these lovely themes. 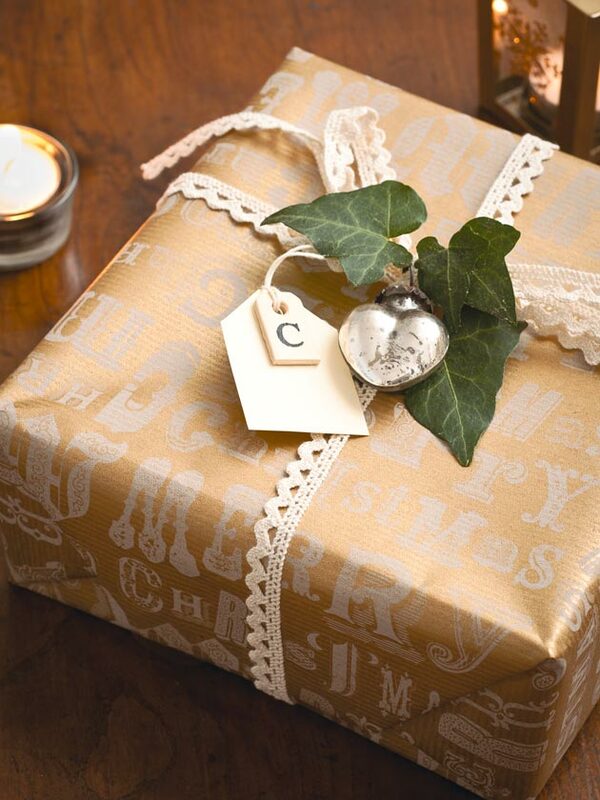 1 Wrap your present and decorate one end of the parcel with a couple of strips of ribbon and affix to paper using glue or double-sided tape. 2 Gather a handful of mismatched buttons and brads, or beads and glue in a scattered formation on top of the present. 3 Cut a small rectangle from brown card, top with a smaller piece of lace and glue in place. Add a Santa hat cut from felt and a pompon. Make a hole in the top, thread with string and hook around a button to attach. 1 Put gift in the centre of a new tea towel and gather sides into a bunch. 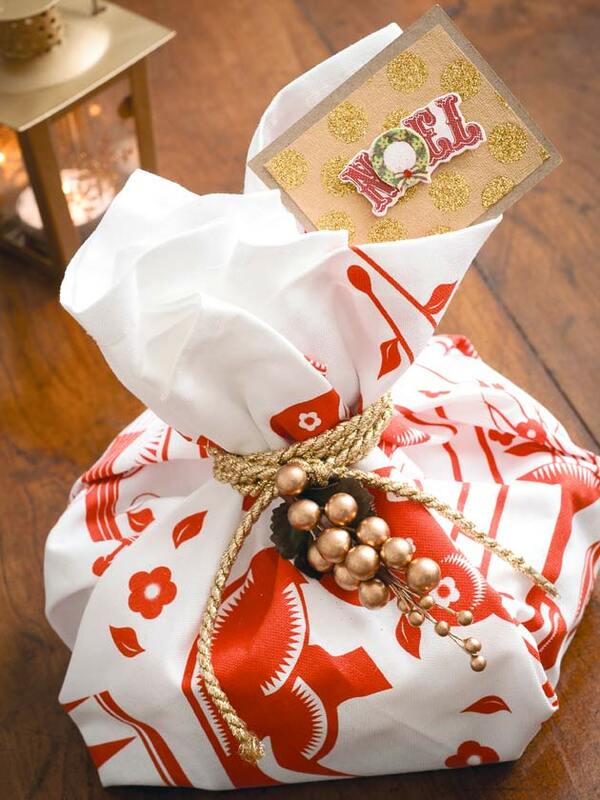 Secure with an elastic band, then tie with cord, ribbon or lace to cover elastic band, and attach berry sprig. 2 Glue a rectangle of gift wrap on to a slightly larger piece of card and affix a Christmas sticker. 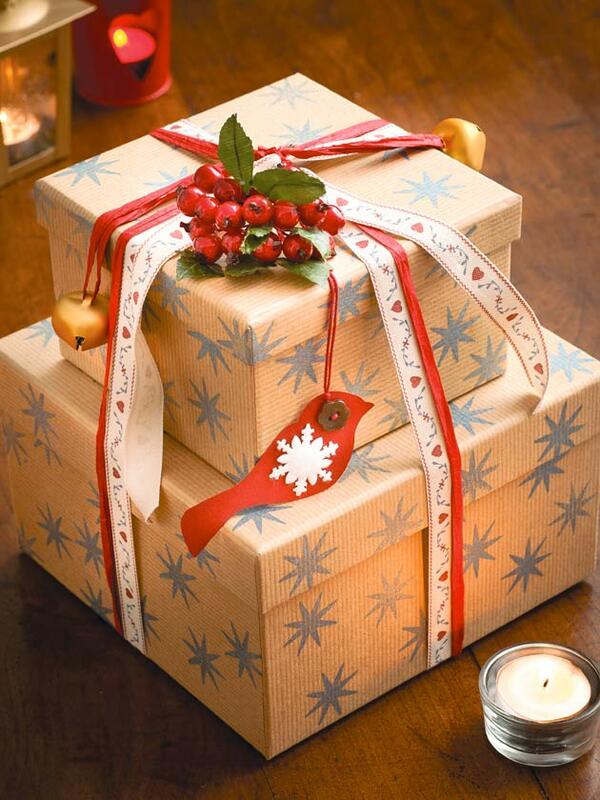 1 Decorate brown-paper gift boxes using a star stamp and a metallic ink pad. 2 Stack matching boxes and tie with raffia and ribbon, adding metal bells and fresh or faux berries or foliage. 3 Draw and cut out a bird shape from card or an old greetings card. Thread string through button for the eye, then glue in place. 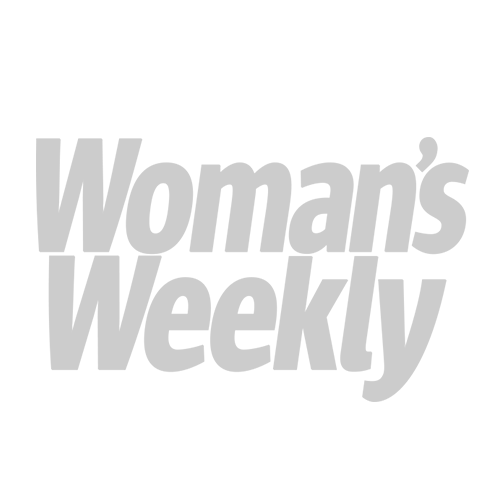 Add a decorative snowflake. 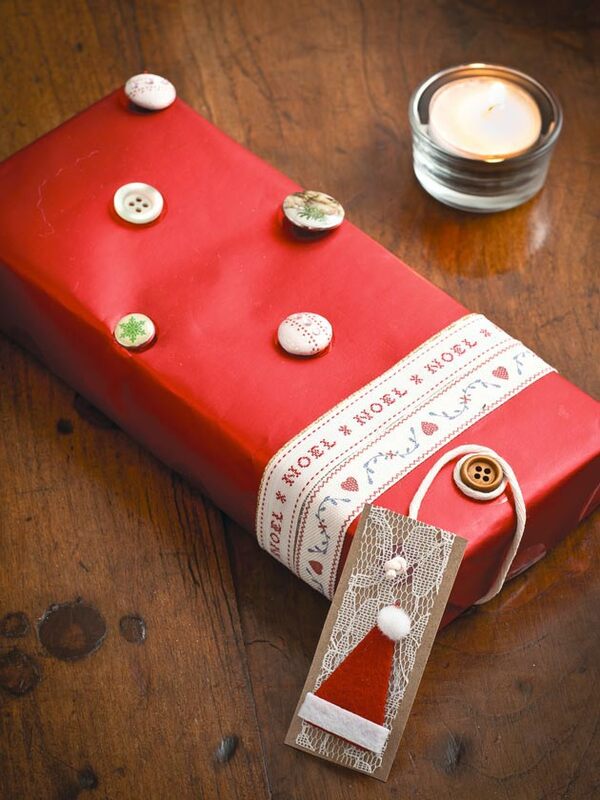 1 Wrap your present in plain or decorative paper, adding a thinner strip of contrasting paper around the centre. Edge thinner paper strip with lace. Secure everything with double-sided tape. on another decoration, such as a bird. 3 Cut out a small rectangle from brown card or use a luggage tag. Decorate with a sparkly snowflake topper or sequins and attach with a mini wooden peg. 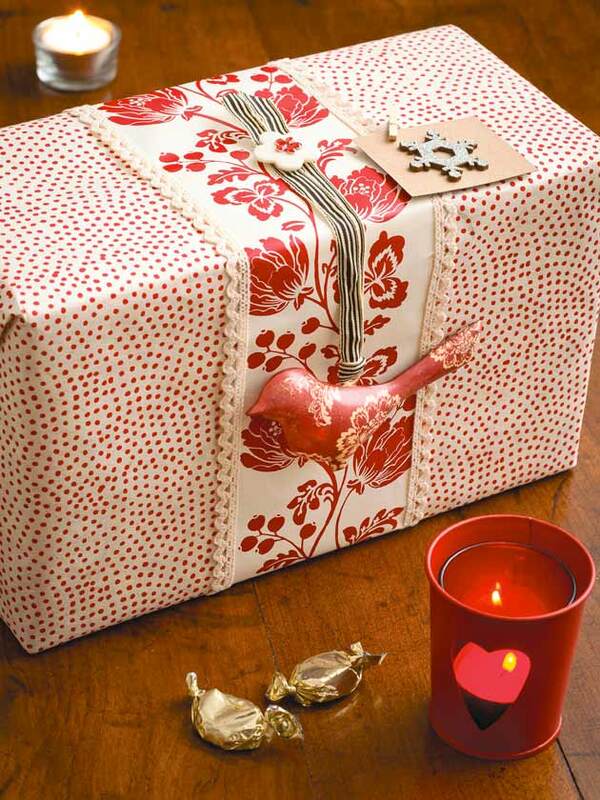 1 Pick a vintage-look gift wrap, or use plain brown or recycled paper. Tie up with lace trim tied in a bow. 2 Slide an antique heart decoration and a few ivy leaves through the ribbon before tying it. 3 Use a mini luggage tag, or cut one from card, and team with a mini wooden letter tag in the initial of the recipient. Thread with thin, matching string. 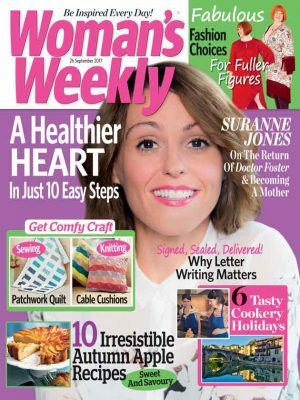 You could use a computer print of letters in the font and size of your choice, cut out and stick to the tag. 1 Fill a vintage tin or glass jar with sweets, soaps, or potpourri. Tie with ribbon from top to bottom, leaving long ends draping and dress the lid with faux mini roses. 2 Draw a butterfly from decorative paper or card and cut out. 3 Use a Christmas decoration as a tag, painted with the recipient’s name, and hang round neck of a jar.